Since ancient times, people have been joining dissimilar metals. Ornaments and trinkets were made with metals of differing colors and workability, even though the joining methods used in ancient times were very different from those in present. Nowadays, joining dissimilar metal is indispensable in manufacturing and constructing advanced equipment and machinery. Different kinds of metals feature different chemical, physical, and metallurgical properties: some are more resistible to corrosion, some are lighter, and some are stronger. Joining dissimilar metals is. therefore, to compose different properties of metals in order to minimize material costs and at the same time maximize the performance of the equipment and machinery. Presently, the methods of joining dissimilar metals include fusion welding, pressure welding, explosion welding, friction welding, diffusion welding, brazing, and soldering. This article, however, discusses fusion welding only, because it is used in a wide range of industries. Among various combinations of dissimilar metals, some can readily be fusion welded, but some cannot because of inherent features of particular metals. Joining austenitic stainless steel (more resistible to corrosion) to carbon steel (more easy to process and inexpensive) is a common combination that can readily be fusion welded, provided the welding procedure is proper. In welding Type 304 to mild steel for instance, the choice of filler metal is a key point. If you use Type E308 filler metal, the diluted weld metal with the formation of martensite (a brittle structure) may contain cracking, because the filler metal cannot tolerate dilution by both base metals. A proper filler metal, in this case, is Type E309 for applications below 800°F (427°C) in general. 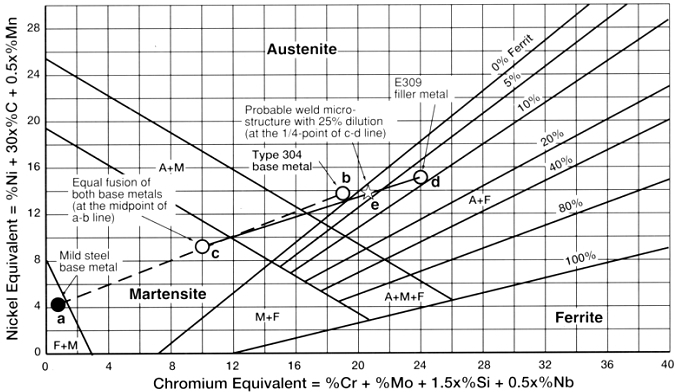 The procedure of estimating the microstructure of the E309-type diluted weld metal can be done by using a Schaeffler diagram (Fig. 1): the diluted weld metal will contain about 4% of ferrite and no martensite in the austenitic matrix, which is resistible to cracking. Fig. 1 — A Schaeffler diagram and the procedure (a→b→c→d→e) of estimating the microstructure of E309-type diluted weld metal in welding Type 304 to mild steel.